Untuk mencapai visi perusahaan yaitu menjadi kelompok bisnis terkemuka di Indonesia yang memberikan pelayanan terbaik kepada stakeholder-nya, PT Global Tiket Network sedang mencari pemuda - pemudi terbaik yang sangat kompeten dan termotivasi diri untuk mengisi posisi lowongan kerja terbaru 2016. Persyaratan : Demand and supply, the basics of economics. The role of the business analyst is to think of ways of how to move the supply curve to reach an optimal equilibrium with the travelers’ demand curve. Have a Bachelor’s degree in business related fields including: accounting, finance, economics or marketing. A willingness to learn is a must! Persyaratan : A data scientist is someone who is better at statistics than any software engineer and better at software engineering than any statistician. Is it you? You do not have to be Superman, but you need to be Iron Man to conquer: math, statistics, data wrangling, machine learning and data visualization techniques. We are looking for candidates who can juggle with Python, R, or Matlab; and can mix with SQL and big data platforms (Apache Spark or Hadoop). If you consider yourself one, summon your courage and apply for this position! Persyaratan : We love simplicity, that is what we also believe in. We want a simplicity in everything, even finding us. In this modern era, so many people rely on the search engine as their solution. Through the Search Engine Optimization (SEO), we want even more people who know about the simplicity that we have made to the travel industry. More people know, then more people can living up their journey. Not more than 28 years, Minimum Diploma degree, At least have 1 year experience in the same field, Understand about SEO concept, Familiar with social media and Google Analytic, Have an experience in using SEO Tools, Have a passionate in traveling. Persyaratan : To be a system analyst, you must be a software engineer first. You must have the ability to construct a product or service by design and can predict the future needs. That's all. Master in data structure, algorithm, and diagramming software architect. Persyaratan : Your creation is the interface between our service and customer. That's why your ability to bring great front-end interface is very important. Persyaratan : We need PHP Engineer who always cares about clean code, works with framework, and is eager to maintain good documentation. At least have 1 year experience as PHP engineer with good PHP framework such as CodeIgniter, Phalcon, or Laravel. Persyaratan : We know you are not a magician, but with your code, you can develop product like a magic. Experience with Java, design pattern and clean code. Have Java open source projects is a value-added. Persyaratan : We love Android environment, with huge market and support from Google also open source communities, we believe in the future of Android. We hope you are one of them. Experience with Android Studio and material design. At least have three published Android applications. Have Android open source project is a value-added. Persyaratan : As the essential component in the mobile application industry, Apple with the iOS has a unique and exclusive product. That is why they got bigger users each year. Looking at this market, we also see a big potential for the iOS users, for us as a travel agency, or for the whole travel industry. Like the Apple’s spirit to “think different”, we also have the vision to draw the different way in the travel industry. This could be your challenge as the iOS Engineer to bring a better service through the iOS, so we can ask more people to simplify their journey and see it in a different way. Master in both of Swift and Objective-C. Always think different. Persyaratan : Have you ever wondered how the final product was made? For us, a final product is the most important thing. We can’t force the customer to believe in the product that we don’t trust ourselves. Therefore, final checking in a production process could be a crucial part. As a Software Quality Assurance, you have to assure that our products are running well as the acceptance criteria from product owner, and working good for the customer. We need you who are master in Software Quality Assurance. Persyaratan : Well, let us talk about science. We all know that we can do everything we want or creating something from the data, but not all of the data can be processed. We are challenging you to change the rough data into a simple language (and reliable too), so it can be used for the business analyst, product analyst, or even for our client. We need you who are master about the technical of SQL/noSQL database and data preparation. Bagaimana anda tertarik bekerja di PT Global Tiket Network ....? 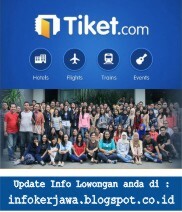 0 Response to "Lowongan Kerja Tiket.com (PT Global Tiket Network)"